Copper peptides are the combination of small amino acid chains with copper 2+ (blue copper). Dr. Pickart's entire career focused on the question of why blood from young persons (20-25) supported cells and tissues better blood from older persons (60-80). During this work, he isolated the copper binding tripeptide GHK (Gly-His-Lys) which appeared to be the major reason for the superiority of young blood. For skin health, a variety of copper peptides are able to transfer nutritional copper into the skin. GHK-copper works well on skin but Pickart has found other copper peptides that are more effective. GHK's unique chemistry only becomes important within the human body. There is a fierce competition for copper 2+ and GHK has the exact binding affinity to transfer copper in and our of cells and tissue. Almost, all other peptides cannot compete for copper 2+ in the body. However, there are very low levels of GHK in the body and the small amount of copper it transfers must trigger a special system that controls or strongly affects about 3,600 human genes or 16% of the human genome. We are currently analyzing genome and biochemical data to understand the function of GHK in humans. The primary cause of aging and disease is a silencing of active genes as we age but these dormant genes can be turned on under the right stimulus. GHK may act to "set" "or "reset" the youthful gene pattern. The Ubiquitin/Proteasome system removes damaged proteins from cells. If these damaged proteins are not adequately removed, the cell cannot function properly. This system is also critical for the repair of damaged DNA after ultraviolet radiation exposure. 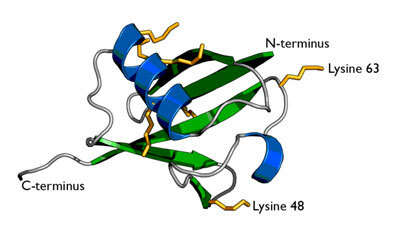 Ubiquitin is a small protein also called "The Kiss of Death Protein". It attaches itself to damaged proteins. Then the damaged proteins are taken to the proteasomes, which are like the little garbage disposal unit in your sink, and broken down. 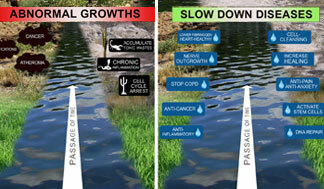 Our genome studies found that GHK stimulates gene expression in 41 UPS genes while suppressing 1 UPS gene. 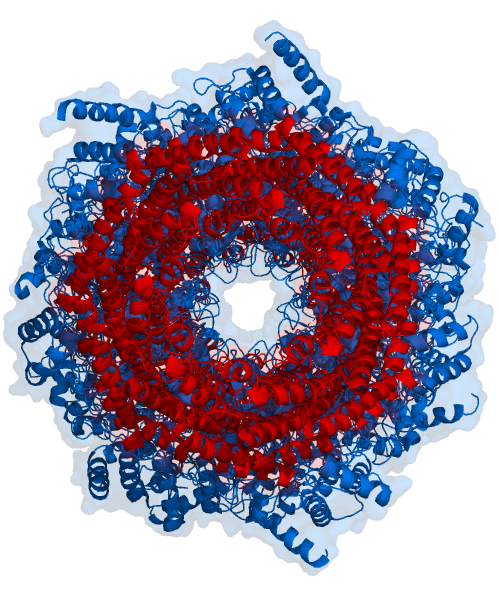 The proteasome is like an open-ended barrel. The damaged protein is pulled in one end, chopped up, and the pieces come out the other end. Top graphic: Its active sites are sheltered inside the tube (blue). The caps (red; in this case, 11S regulatory particles) on the ends regulate entry into the destruction chamber, where the protein is degraded. Bottom graphic: The damages protein is pulled into one end of the proteasome and the pieces sent out the other end. CHEMICAL SUNSCREENS: prevent sunburn by absorbing the ultraviolet (UVB) rays but may increase your risk of cancers of the breast, ovaries, prostate, and colon. Chemicals such as avobenzone, benzophenone, ethylhexyl p-methoxycinnimate, 2-ethylhexyl salicylate, homosalate, octyl methoxycinnamate, oxybenzone (benzophenone-3) are used as the active ingredients. PHYSICAL SUNSCREENS: contain inert minerals such as titanium dioxide, zinc oxide, or talc and work by reflecting the ultraviolet (UVA and UVB) and visible rays away from the skin. 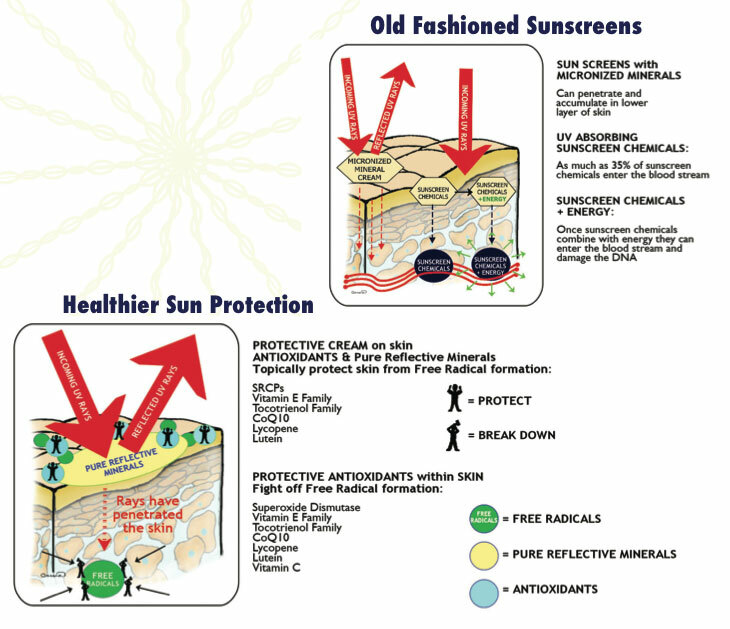 These come in two forms - pure sunblocker and various micronized or encapsulated versions. Pure sunblockers tend to give a pasty look to the skin. This is the reason for the use of micronized sunblockers which give a better cosmetic appearance on the skin. However, Prof. Nicholas Lowe (Dermatology, UCLA) has reported that micronized or encapsulated physical sunblockers such as titanium dioxide penetrate into the skin while pure titanium dioxide remains on the skin's surface - where you really want it to stay. Micronized minerals are usually used as 'micronized' particles in the size range of 20-50 microns. But these particles are small in comparison with the wavelength of the ultraviolet and visible light and are virtually invisible and do not effectively scatter of reflect light. Pure, non-miconized, and often pasty, minerals are better reflectors of ultraviolet light. If you plan to spend hours basking on the beach and want UV protection, use a pure reflective sunblocker. These products contain inert minerals such as titanium dioxide, zinc oxide, red petrolatum, and talc and work by reflecting (rather than absorbing) ultra-violet rays. Choose a pure product with an appropriate sun protection factor (SPF) based on how much time you plan to spend in the sun. An SPF of 15 will provide 15 times the amount of protection you would get without using anything. So if 10 minutes in the sun is enough to turn you red, a sunscreen with an SPF of 15 would allow you to stay out for 150 minutes before burning. The best reflective sunblockers consist of non-micronized titanium dioxide and zinc oxide. These minerals, usually white in color, are safer than transparent micronized products that can penetrate the lower skin layers. A pasty hue is the price we pay for safe fun in the sun. Micronized or nanoparticles are coated with silicone or other chemicals to make them transparent. These tiny molecules have the potential to inflict DNA damage in human cells. Some feel that heavy use of zinc oxide increases facial pore size. If skin acids release ionic zinc from zinc oxide, this may enter the skin and inhibit the skin repair actions of ionic copper. Therefore, titanium-dioxide is my preferred sunblock. What is Lutein? It is a powerful antioxidant from plants that normally is present in the human body. Lutein also serves as an antioxidant that helps screen harmful ultraviolet rays that can damage our skin. Harvard and Cornell Universities have proposed that lutein may be helpful in reducing the negative effects of high energy wavelengths of light on skin. Moreover, skin hydration may be positively affected by lutein as well. Lutein as a supplemental antioxidant may counteract depletion of the skin's natural antioxidants due to damage to over exposure to ultraviolet light and other environmental factors. Topically applied tocotrienols selectively accumulate in skin and serve to protect it against ultraviolet damage and oxidation. (Traber et al 1997). Diet alone cannot supply adequate amounts of tocotrienols for skin protection. In rats it was found that UV radiation significantly reduced vitamin E concentrations after 29 minutes of UV exposure, but in skin treated with tocotrienols the vitamin E concentrations were 7 to 30 fold higher after the radiation. Ubiquinone is an oxidative reduction agent that functions in the energy-producing electron transfer chain in the mitochondria of cells. It also serves as an important lipid-soluble antioxidant in the skin and other organs. It protects against free radical damage from peroxides that damage collagen and elastin, thus protecting against a loss of elasticity in the skin and wrinkle formation. Animals fed ubiquinone have lower cancer rates and its discoverer, Dr. Karl Folkers, suggested that ubiquinone might control cancer either by facilitating antibody synthesis or by counteracting tumor cell functioning. His ideas were based on case reports of unexpected or unusually long survival for cancer patients who were using ubiquinone for cardiac problems. Melatonin is a hormone connected with sleep patterns and also a powerful human antioxidant that protects against UV radiation. Researchers at the University of Zurich have shown that topically applied melatonin gives excellent protection against sunburn if applied before sun exposure and also may have role in repairing burned skin. In small amounts, melatonin causes skin cells to proliferate. People with psoriasis and atopic eczema have low melatonin levels. Our goal for safer suntanning is based on the following. 1. Decrease total sunlight exposure by increasing the skin's efficiency of sunlight-induced melanogenesis. Dr. Martin Rieger has discussed the chemistry of oxidation and peroxidation his publications, emphasizes that melanin, the skin's pigment, is also a free radical scavenger, and somewhat "photo-protective" in a sense which that is unrelated to its light-scattering ability. Increasing the efficiency of sunlight-induced suntanning would reduce the amount of sun exposure to produce the skin's melanin and reach a desired tan level. This reduces the skin damage incurred while tanning. Copper is the catalytic metal in the enzyme, tyrosinase, that, after suntanning, converts the amino acid tyrosine into the protective skin pigment, melanin. If your skin lacks adequate nutritional copper, no amount of suntanning will produce enough melanin to obtain a tan. Instead, you will only suffer more sunburn. Clinical researchers at the University of California at San Francisco and the Shanghai Medical University reported copper peptide creams facilitated an increase in true skin melanin formation (not merely the staining of the skin) even with indoor (non-ultraviolet) light. Melanocytes, the cells responsible for skin pigment, are located in the epidermis, the uppermost layer of skin. In contrast, the network of collagen and elastin which keeps the skin supple, elastic and wrinkle-free, is located deeper down in the dermal layer. In order to keep more photons in the upper layer with the melanocytes and away from the collagen/elastin, we developed a light diffusing opaque cream by the incorporation of minute particles of the reflective sunblocker - titanium dioxide powder. By putting the small amount of reflective titanium dioxide into the cream, we can increase this bouncing and diffusion and stop more photons from going deeply into the skin and turn more of them to the side and thus keep them - to a greater extent - in the uppermost skin layer. The only wavelength of light needed for sun-induced melanin formation is that wavelength which supplies energy to the melanin-producing enzyme copper-tyrosinase. Photons of a certain wavelength tend to stay in areas where there are molecules that can easily absorb them. This is similar to radio antennas which absorb best at a certain "tuned" length. To "tune" the retained photons, we use the copper peptide complexes in the cream. A significant potion of these copper-peptide complexes have structure that is similar to the melanin-forming tyrosinase-copper complex. This should decrease the amount of light needed to activate the melanin producing reaction. 4. Increase anti-oxidant protections on the skin and within the skin with copper peptides and other antioxidants. The primary antioxidant system in humans is Superoxide Dismutase. Newer copper peptide creams contain a patented (US Patent 5,698,184) copper-peptide complex that acts as a superoxide dismutase mimetic that can help de-toxify oxygen radicals produced by ultraviolet rays on the skin's surface. Creams containing superoxide dismutase activity have been proven to help protect skin during ultraviolet radiation exposure. (Reference: Miyachi Y, Imamura S, Viwa G. Decreased skin superoxide dismutase activity by a single exposure of ultraviolet radiation is reduced by liposomal SOD pre-treatment. J Invest Dermatol 1987; 87:111-2). Advanced copper peptide products may also contain additional anti-oxidants such as vitamin E, tocotrienols and Ubiquinone. Supplements of key anti-oxidants have been found to increase the skin internal resistance to ultraviolet damage as mentioned above. So, for at least three days before tanning, take a daily supplement of vitamin C ( 1 gram), Co-Q10 (30 mgs), alpha lipoic acid (100 mgs), vitamin E (400 units), and tocotrienols (35 mgs). If less suntanned skin is lost by peeling, less sun exposure will be required to keep the suntan. As suntanning increases pigmentation of the skin it also induces a mild erythema or redness, thus producing the reddish-brown tint to the natural skin color that is so sought for. However, this action produces certain levels of damage to the skin barrier. For example, transepidermal water loss from skin increases. This damage must be promptly repaired or the newly tanned skin will peel off. Copper peptide creams help the processes of skin barrier repair. For decades, tryrosine-copper complexes have been used in tanning lotions. Today’s media tries to convince women that their natural skin color is not aesthetically beautiful. Dark-skinned women can become a target for skin lightening cosmetics, while fair- skinned women are pressured to tan. This can be very dangerous. The beauty of dark skin lies in its ability to produce abundant melanin, which gives it an excellent, natural defense. Darker skin tones are more resilient and are able to withstand intensive UV irradiation for longer periods of time. When we try to prevent this skin type from producing melanin, in essence we violate it, destroying its fortress of protection. On the other hand, fair skin often produces little melanin. It evolved in Northern areas where the most important task for skin health was to ensure vitamin D production; UV light defense was not as much of an issue. So this type of skin should not be pushed or forced into wild melanin production. It should naturally be kept fair and exposed to sun only during morning hours for a limited period of time. Light tanning with a titanium dioxide sunscreen is best, whereas attempts to achieve an unnatural darker tan can prove quite dangerous. My best advice would be: Treasure and love the skin you have. Refuse to damage it with unnatural bleaching or tanning methods. Remember, beautiful skin is skin that is healthy and youthful regardless of its color! Being “smart about sun” means avoiding trends pushed upon us by the media. Find beauty in your skin by not altering your natural skin type and color. In 1984, I observed that GHK-Cu possesses a mild antioxidant activity similar to the enzyme superoxide dismutase, which manifests itself as a calming of red and irritated skin. Steve Aust’s lab at Utah State University discovered that GHK-Cu blocks the damage-induced release of oxidizing iron molecules from ferritin. Further discoveries followed. Vinci et al. at the University of Catalina in Italy reported that GHK-Cu blocks tissue damage by interleukin-1. Soon after, Robert Koch’s lab at Stanford University reported that GHK- Cu shuts down the production, by normal and keloid fibroblasts, of the scar- forming protein TGF-ß-1. Interestingly, they also found that retinoic acid, which is thought to trigger remodeling, actually increases this scar-forming factor. Canapp et al. found GHK-Cu suppresses the tissue damaging cytokine TNF-alpha (tumor necrosis factor-alpha) and shifts the balance of proteases that dissolve proteins, and anti-proteases toward more anti-protease activity. Canapp SO Jr, Farese JP, Schultz GS, Gowda S, Ishak AM, Swaim SF, Vangilder J, Lee-Ambrose L, Martin FG. The effect of topical tripeptide-copper complex on healing of ischemic open wounds. Vet Surg. 2003;32(6):515-23. In wound healing models, biotinylated GHK increases the production of anti-inflammatory proteins such as copper, zinc-superoxide dismutase that detoxifies oxygen radicals. GHK-Cu also acts to detoxify some dangerous products of free radical reactions. Beretta et al. discovered these effects of GHK-Cu and proposed that this molecule may be useful in preventing many degenerative diseases of aging such as Alzheimer’s disease, neuropathy, retinopathy, atherosclerosis and diabetes. They demonstrated that GHK binds alpha,beta-4-hydroxy-trans-2- nonenal—a toxic product of fatty acids lipid peroxidation that plays an important role in the pathogenesis of several age related conditions. Beretta G, Artali R, Regazzoni L, Panigati M, Facino RM. Glycyl-histidyl-lysine (GHK) is a quencher of alpha,beta- 4-hydroxy-trans-2-nonenal: a comparison with carnosine. insights into the mechanism of reaction by electrospray ionization mass spectrometry, 1H NMR, and computational techniques. Chem Res Toxicol. 2007 Sep;20(9):1309- 14. 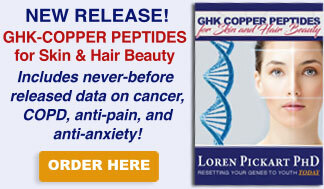 Are Copper Peptides The Answer? GHK is the original skin remodeling copper peptide. 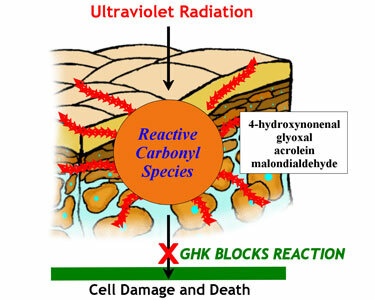 GHK can provide a way to protect our skin from UV free radicals. It may provide the answer to a nagging question; how can we protect our skin without applying harmful chemicals? UV damage is mediated through molecules called Reactive Carbon Species (RCS)—a carbon equivalent of oxygen free radicals. When the UV energy transfers to the RCS molecules, they damage the components and cells of the skin. Ultraviolet radiation increases skin damage by generating Reactive Oxygen Species (ROS) and Reactive Carbonyl Species (RCS). The Broad Institute Gene Pattern found GHK to increase the activity of the SRRR2C human gene 8.2-fold. It produces a small, proline-rich, anti-oxidant protein that protects outer skin cells from oxidative damage from Reactive Oxygen Species (ROS). When the ROS level is low, the protein remains in the outer cell membrane but when the ROS level is high, the protein clusters around the cell's DNA to protect it. Vermeij WP, Florea BI, Isenia S, Alia A, Brouwer J, Backendorf C. PROTEOMIC IDENTIFICATION OF IN VIVO INTERACTORS REVEALS NOVEL FUNCTION OF SKIN CORNIFICATION PROTEINS, J Proteome Res. 2012 Apr 23. Protection against injurious external insults and loss of vital fluids is essential for life and is in all organisms, from bacteria to plants and humans, provided by some form of barrier. Members of the small-proline-rich (SPRR) protein family are major components of the cornified cell envelope (CE), a structure responsible for the barrier properties of our skin. These proteins are efficient reactive oxygen species (ROS) quenchers involved not only in the establishment of the skin's barrier function but also in cell migration and wound healing. Here, a proteomic analysis of in-vivo SPRR-interacting proteins confirmed their function in CE-formation and ROS-quenching and also revealed a novel unexpected role in DNA-binding. Direct in-vitro and in-vivo evidence proved that the DNA-binding capacity of SPRRs is regulated by the oxidation state of the proteins. At low ROS levels, nuclear SPRR is able to bind DNA and prevent ROS-induced DNA damage. When ROS levels increase SPRR proteins multimerize and form an effective antioxidant barrier at the cell periphery, possibly to prevent the production or infiltration of ROS. At even higher ROS exposure DNA-binding is restituted. A molecular model explaining how the intracellular oxidation state of SPRRs likely influences their selective protective function is provided. Vermeij WP, Alia A, Backendorf C. ROS quenching potential of the epidermal cornified cell envelope. J Invest Dermatol. 2011 Jul;131(7):1435-41. The cornified cell envelope (CE) is a specialized structure assembled beneath the plasma membrane of keratinocytes in the outermost layers of the epidermis. It is essential for the physical and permeability properties of the barrier function of the skin. Our skin is continuously exposed to atmospheric oxygen and threatened by reactive oxygen species (ROS). Here, we identify the CE as a first line of antioxidant defense and show that the small proline-rich (SPRR) family of CE precursor proteins have a major role in ROS detoxification. Cysteine residues within these proteins are responsible for ROS quenching, resulting in inter- and intramolecular S-S bond formation, both in isolated proteins and purified CEs. The related keratinocyte proline-rich protein is also oxidized on several cysteine residues within the CE. Differences in antioxidant potential between various SPRR family members are likely determined by structural differences rather than by the amount of cysteine residues per protein. Loricrin, a major component of the CE with a higher cysteine content than SPRRs, is a weak ROS quencher and oxidized on a single cysteine residue within the CE. It is inferred that SPRR proteins provide the outermost layer of our skin with a highly adaptive and protective antioxidant shield.